This simple and light pasta dish is easy to make, great for the springtime, and – quite simply – delicious and satisfying. I’ve made many variations of this in the past, and I’ve posted a version or two as well, but the one below is by far the best. This dish uses rich, full and simple flavors that play well off of and enhance one and other. It’s pretty simple, the salmon is a rich, bold flavor, that’s enhanced by the lemon. The wilted arugula gives the whole dish the peppery notes that it needs to balance out the salty parmesan cheese, and the asparagus provides that rich, nutty flavor to round out the entire profile. Follow the directions to create your own! Ok – this is an easy one. First, preheat your oven to 400 degrees, and place a pot of salted water to boil on the stove. Flatten a piece of aluminum foil over a large, rimmed cookie sheet. The aluminium foil is to make clean-up easier – if you don’t care about cleaning up the pan, go ahead an forgo the aluminum foil. Prep the asparagus by cutting the bottoms off, laying the stalks out on the foil, and tossing them with a tablespoon of extra virgin olive oil and a dusting of salt and pepper. You can also add some lemon zest to give the greens some extra zing! Prep the fish by cutting the fillet into two or thee pieces. Give the fillet (0r pieces thereof) a generous dusting of salt and pepper, and then cover the exposed flesh with thin slices of lemon. Topping salmon with lemon slices is my new favorite trick. If adds some citrus flavor, and keeps the fish nice and moist! Unless there’s room on the side of the asparagus to place the fish, you can go ahead and layer the fillets on top of the stalks. Bake the asparagus and fish in the preheated oven. This should take about 15 minutes. At the same time, cook the pasta, drain it, and rinse it with cold water so it doesn’t overcook. Reserve 1/2 a cup of the water from cooking the pasta. In a large skillet, pot or frying pan (I usually use a large, non-stick frying pan) heat a tablespoon of oil over medium-high heat. You can also reuse the pasta-water pot for this after you drain it out: the high sides will be useful for stirring around all of the stuff that you add back in. Once the oil is hot (it splatters if you flick a little water into it) add the garlic and saute until golden-brown and effervescent. This should take no more than 60 seconds. Add the arugula, pasta, the 1/2 cup of reserved pasta water and the juice of one of the lemons. Fold the ingredients together, allowing the arugula to wilt, which should take about five minutes. 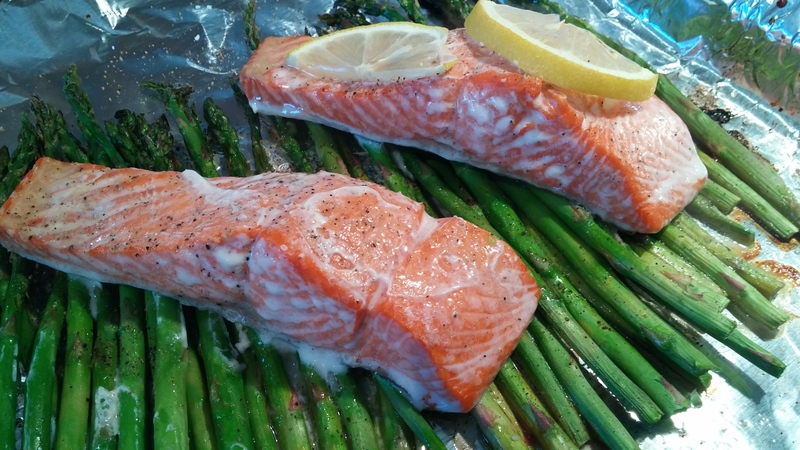 In the meantime, flake the salmon using two forks, and chop the asparagus into short (3/4 inch – 1 inch) pieces. 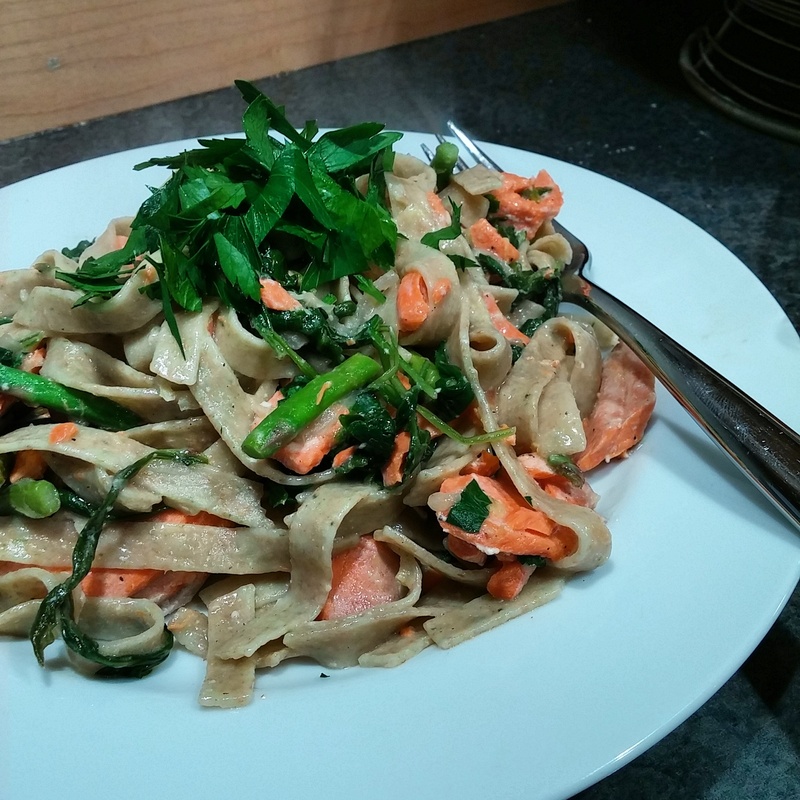 Once the arugula is wilted, season the mixture with salt and pepper (to taste) and fold in the salmon, asparagus, Parmesan cheese and 1/2 cup of the chopped fresh parsley. Serve – in generous portions, because it’s delicious – as soon as the cheese is melted, with a pinch of fresh parsley, and a bit of lemon zest (but only if you’re feeling zesty… get it? ).